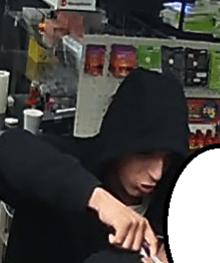 On October 10, 2016 at about 9:19PM, Officers responded to an aggravated robbery at the Mickey’s Convenience Store located at 4701 Clear Creek. Upon arrival, Officers met with the clerk who reported that a Black Male wearing a white ball cap, brown vest over a dark shirt entered the store and pointed a handgun, demanding money. A second suspect, a white male wearing a black hooded sweat shirt and brown pants, waited at the door. After removing the money from the register, both suspects fled on foot in an unknown direction. 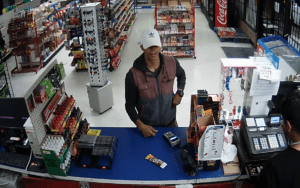 On October 10, 2016 around 10:36PM, Killeen Police Officers responded to reported aggravated robbery at the Star Mart located at 1704 Old FM 440. Officers met with the clerk of Star Mart and learned that a white male entered the store wearing a black hooded sweatshirt and tan pants. The suspect produced a handgun and pointed it at the clerk, demanding money. A second suspect, a black male who had previously entered the store and made a purchase, stood at the door and waited for the first suspect. Both suspects fled the scene on foot with an undisclosed amount of cash. Killeen Police believe the robberies are related. The white male is described as 18-22 years old, 5’ 07” to 5’ 10” tall, medium build. The black male is described as 18-22 years old, 5’ 07” to 5’ 10” tall, thin build. They are considered armed and dangerous and should not be approached. 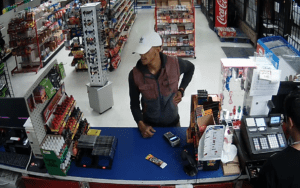 Detectives are asking anyone who has information about this robbery to contact Crime Stoppers at 526-TIPS (8477) or go online anonymously at www.bellcountycrimestoppers.com. You can also download the app P3 tips on IOS and Android phones. All information is anonymous and confidential and if your tip leads to the arrest of the person responsible for this crime you could be eligible for a reward up to $1,000 in cash.